Atrial fibrillation (AF) is the most common sustained cardiac arrhythmia in clinical practice, and is becoming a major public health concern. To better understand the mechanisms of this arrhythmia an accurate analysis of the atrial activity (AA) signal in electrocardiogram (ECG) recordings is necessary. 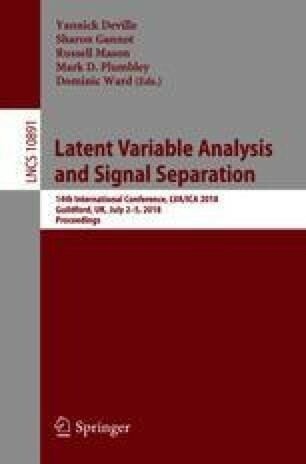 The block term decomposition (BTD), a tensor factorization technique, has been recently proposed as a tool to extract the AA in ECG signals using a blind source separation (BSS) approach. This paper makes a deep analysis of the sources estimated by BTD, showing that the classical method to select the atrial source among the other sources may not work in some cases, even for the matrix-based methods. In this context, we propose two new automated methods to select the atrial source by considering another novel parameter. Experimental results on ten patients show the validity of the proposed methods. P. M. R. de Oliveira—Funded by a Ph.D. scholarship from the IT Doctoral School of the Université Côte d’Azur. V. Zarzoso—Member of the Institut Universitaire de France.